Classic Carpet & Flooring has extensive experience in re-flooring commercial areas. Whether your office space is strictly utilitarian and requires something to handle a stampede of traffic or if you have a more creative workforce and want to make a stylistic impact on your clients, we can find the right solution for you. Our client list includes St. Louis’s Top fortune 500 companies, municipal governments, as well as small businesses. UPDATE YOUR LOOK WITHOUT LOSING PRODUCTIVITY. Classic Carpet & Flooring can work with you to install your new flooring overnight or on off-days so that we don’t disrupt your workforce. We also use specially-designed lift systems that will raise your work space stations without requiring your “cubevilles” to be dismantled. Obviously that will save your employees lost time and save you many headaches. MYRIAD POSSIBILITIES. ONE PERFECT SOLUTION. We have installed carpet, carpet tiles, vinyl (VCT) tile, sheet vinyl, laminates, ceramic and more in commercial applications throughout the region. Which product works best for your work space Do you have reoccurring stains? Is it storage space or office space? Is it functionality that is required or do you need to impress clients? Our sales people can discuss with you which products would work best for your situation and help you pick the right colors. Do your employees have a propensity to spill their coffee? Do they keep snagging the carpet in the hall and pulling rows of fiber out? We can show you the different options available to end those problems. We will help you find the right products, so you can stop worrying about your flooring and start worrying about the work at hand. PROFESSIONAL BIDS AND PROFESSIONAL EXECUTION. Just like with residential bids, our design consultants will meet with you promptly and show you products and provide no obligation bids. Call or click today to set up a free appointment. Wonder what product is best for your work space? 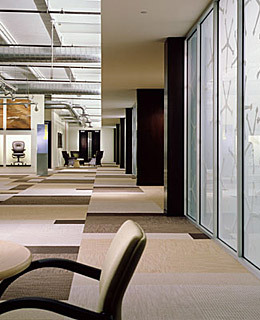 Our “Commercial Flooring 101” has detailed information that will help you decide.